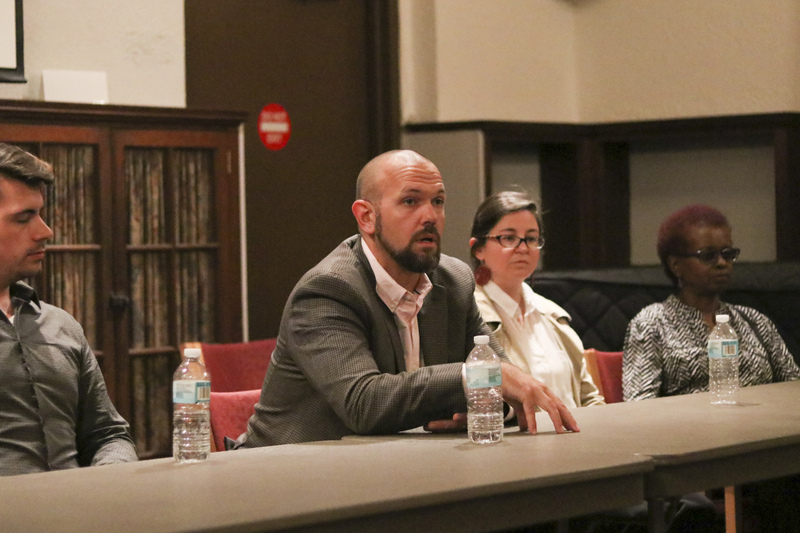 On Monday, Sept. 18, the Greater Middletown Young Democrats hosted Middletown’s Democratic candidates for the Board of Education (BOE) and Planning, Zoning, and Conservation Committees in Russell Library. The event began with mingling in the Hubbard Room of the Russell Library at 6 p.m., followed by the panel at 6:30 p.m.
University Professor Stephen DeVoto, current chairman of the Middletown Planning and Zoning board, spoke first at the panel. He received his bachelor’s degree from Haverford College, his master’s from Wesleyan University, and a doctorate from Rockefeller University. Currently, he teaches courses in the Neuroscience and Behavior and Biology departments. At the panel, DeVoto talked about how the committee needs to work harder with planning. The next candidate was Nicholas Ficaro, who graduated in 2003 from Wentworth Institute of Technology in Boston with a bachelor’s degree. Ficaro is a member of the American Institute of Architects and now works as a senior architect at Centerbrook Architects and Planners. Ficaro initially described to the panel his qualifications for office. If elected, Ficaro aims not only to attract business but also to make sure that new developments fit into the city’s culture. “One of the goals of planning and zoning is to bring in business and bring in the activity, but also making sure that the development is right for the place they’re putting the development into,” Ficaro said. Candidate Steven Kovach spoke next. Kovach is a former Board of Education candidate, the current Zoning Board alternate, and past president of the North End Action Team. He also holds an associate’s degree in general studies from Middlesex Community College and bachelor’s degree in history from Wesleyan University. Kovach is running for office because he wants to hold a stronger voice among the zoning board. Kovach also cites a lack of communication within Middletown’s council as a reason for running. Candidate Sean King, who’s a Middletown resident of 11 years and a father of two, spoke after Kovach, discussing his involvement in his children’s PTA organizations. As an active participant in the Middletown school community, King has served as president and treasurer of the Spencer School PTA and parent representative to the Board of Education’s ad hoc Redistricting Committee. Currently, he is serving as vice chairman of the Middletown Citizens Advisory Committee. King cites his main reasons for running for the Board of Education as the need for personnel and for funding; King wants to see more money flowing into local school systems. “I want to be helping to lead our schools and shape a good school system into something even greater,” King said. Candidate Lisa Loomis-Davern stated her case for being elected to the Board of Education. As a teacher with 15 years of experience teaching elementary, middle, and high schoolers, in Middletown, Portland, and Hartford. Currently, Loomis-Davern is pursuing her doctorate in educational leadership from Central Connecticut State University and is a facilitator for the National Conference for Community and Justice. Loomis-Davern began by discussing her tattoo, which says “I am because we are,” meaning that her health as an individual is dependent on the health of her community. As a teacher at a social justice school, Loomis-Davern’s mission is to develop our students to become agents of change. The last candidate, Pat Alston, works as a full-time realtor in Middletown. Additionally, Alston runs an after-school program with Wesleyan students at Cross Street Church for students of all ages. Alston also acts as the Chair of the Education Committee for Middlesex County NAACP and is on the budget committee for the Board of Education. Alston describes how improved parent and child relationships would greatly benefit the educational sphere of Middletown. The candidates then took questions from the audience on their positions and goals if elected to the committee. The Planning, Zoning, and Conservation candidates addressed concerns with the “conservation” part of their name, given that they do not have direct control over the zoning codes, but rather make recommendations to the commission. The BOE candidates addressed particular reforms that they want to make within the local education system, and how members will be able to support reforms in the near future. Kaye Dyja can be reached at kdyja@wesleyan.edu and Hannah Reale can be reached at hreale@wesleyan.edu.